We recommend checking out our discussion threads on the Zynaptiq Pitchmap 1.5 Real Time Polyphonic Pitch ZYN-PM1, which address similar problems with connecting and setting up Virtual Processor Plug-Ins Zynaptiq. The user manual for the Zynaptiq Pitchmap 1.5 Real Time Polyphonic Pitch ZYN-PM1 provides necessary instructions for the proper use of the product Pro Audio - Computer Audio - Virtual Processor Plug-Ins. 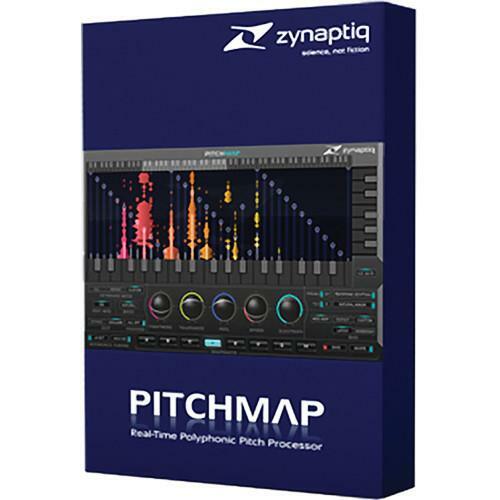 The Zynaptiq Pitchmap 1.5 Real Time Polyphonic Pitch Processor Plug-In is a real time, 64-bit pitch processor that allows you to change the pitch of individual elements of a mixed track. Using either Pitchmap's interface or a MIDI keyboard, you can change the melodies and harmonies of a track, or adjust the pitch and key of an entire mix. Using Zynaptiq's Mixed-Signal Audio Processing, or MAP technology, the Pitchmap breaks a mixed track into its individual components, including its harmonics and transients, before giving you control over their pitch. With the track broken down, you can make changes ranging from subtle corrections in tuning to completely change the key or melodies in the performance or eliminating components altogether. Pitchmap includes a layer of processing dedicated solely to vocal elements, called Natural Mode, which handles the nuances of this range for more realistic pitch adjustment. Pitchmap also allows you to change the overall sonic landscape of your tracks. With the Purify and Electrify parameters, you can alter how synthetic or realistic the changes to your track are, adding another level of sound design. The plug-in supports AU, VST 2.4, RTAS, AAX Native, and AudioSuite plug-in formats on Mac and VST 2.4, RTAS, AAX Native, and AudioSuite plug-in formats on PC. If you own a Zynaptiq virtual processor plug-ins and have a user manual in electronic form, you can upload it to this website using the link on the right side of the screen. Note: MIDI functionality depends on the implementation of the host software. The user manual for the Zynaptiq Pitchmap 1.5 Real Time Polyphonic Pitch ZYN-PM1 can be downloaded in .pdf format if it did not come with your new virtual processor plug-ins, although the seller is required to supply one. It is also quite common that customers throw out the user manual with the box, or put the CD away somewhere and then can’t find it. That’s why we and other Zynaptiq users keep a unique electronic library for Zynaptiq virtual processor plug-inss, where you can use our link to download the user manual for the Zynaptiq Pitchmap 1.5 Real Time Polyphonic Pitch ZYN-PM1. The user manual lists all of the functions of the Zynaptiq Pitchmap 1.5 Real Time Polyphonic Pitch ZYN-PM1, all the basic and advanced features and tells you how to use the virtual processor plug-ins. The manual also provides troubleshooting for common problems. Even greater detail is provided by the service manual, which is not typically shipped with the product, but which can often be downloaded from Zynaptiq service. If you want to help expand our database, you can upload a link to this website to download a user manual or service manual, ideally in .pdf format. These pages are created by you – users of the Zynaptiq Pitchmap 1.5 Real Time Polyphonic Pitch ZYN-PM1. User manuals are also available on the Zynaptiq website under Pro Audio - Computer Audio - Virtual Processor Plug-Ins.